I need a live steam loco. With winter works to extend the line in prospect, it’s clear there will be little left over in the budget for this, though live steam doesn’t come cheap. I’ve been researching the sub £500 end of things – where all the locos are ‘freelance’ (i.e. not based on any prototype) but some are closer to toys (two speeds: lightning fast and stalled) while others are interesting models. I don’t think I need radio control (no gradients at the moment) though it would be nice to have the option to fit it (gradients are planned). I don’t think I need to be able to re-gauge (I don’t know if I’ll go a-visiting, or if I do whether I’ll go to 45mm gauge lines). It would be nice to extend running sessions by topping up the water while in steam. One class of loco to look at are the Mamod types – the original was something of a toy, and a variant of this design is still produced by MSS (the MSS Saddle Tank), with Mamod themselves producing updated versions with higher pressure boilers and better running characteristics (the Mamod Mk III). 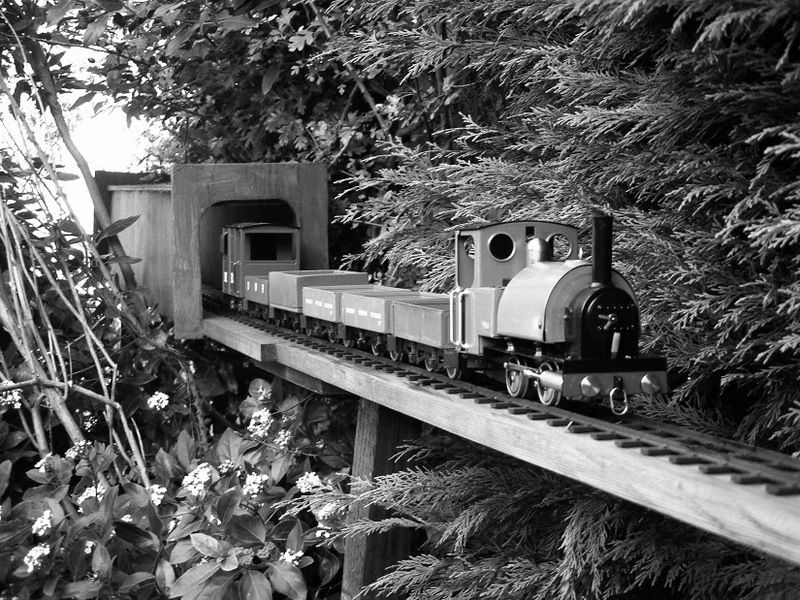 They are small locos, suited to an industrial setting – there are saddle tank variants too (MSS & Mamod), and Mamod produce the Telford, a slightly larger slide-valve version. Unfortunately I find these new Mamods rather ugly, while the MSS locos reputedly run rather poorly – slow running is out. Upgrades are available, taking them from a bargain £185 to between £252 and £410 but if paying this much, the Roy Wood Models Janet looks a better bet – the same charm as these original locos, but almost every component upgraded. There are videos of some impressive slow running, she can have chuff pipe fitted, but… I talked to Roy Wood at the Exeter show, who was fantastically helpful and informative, but he did not make fitting a whistle sound easy – the small size means there’s just not much room for it! Still, Janet is easily the best contender from this lot. Mamod and Roy Wood also produce vertical boiler locos, for which prototypes exist (though they’re not common). I find these curiosities charming, too. Regner is another manufacturer who makes these – several, in fact. All of these except the Roy Wood loco are geared, which makes for excellent slow running – but this means even those to which a chuffer can be fitted don’t do a nice slow chuff. On balance, I’d take the good slow running over the chuffing, if I have to choose. Although Max is a bargain (only £220 as a kit) it needs an upgrade (£40) even just to change direction (£100 for gas conversion). I’d take the Regner Willi as my contender from this batch. Regner also do a couple of geared locos with horizontal boilers (Konrad and Vincent). I’m fairly sure this is not prototypical, but so what? If physics doesn’t scale down neatly, fair enough. I think Konrad looks terrific, the optional spectacle plates make it a little more British in appearance, and it seems like a great slow runner taking gradients in its stride without the need for radio control. Another contender. Finally, going over budget slightly, the big names in 16mm live steam – Doncaster based Roundhouse, and Chinese manufacturer Accucraft – both produce entry level locos. Roundhouse have two basic offerings, both with slip eccentrics (i.e. to reverse them, you have to push in the direction of travel) and gas fired, one externally (Millie) and one internally (Bertie). The Accucraft locos (Jedrig and Ragleth) are internally fired and reverse with a lever. Unlike all the previous locos, radio control can be easily fitted to these locos, but only on the regulator for the Roundhouse locos. All of these would be contenders, if I could justify going over budget! In particular, the Accucraft loco can easily be fitted with chuff pipe and DJB whistle, and lots of modifications are available – even coal firing (at a price!) and I’ve seen lots of videos of it running very well slowly (although these may have been using R/C). But then again, the Accucraft in particular is quite large for a 2′ gauge loco. I’m trying to think of that as an advantage – a good test for all the clearances on the line! So, which should I get? Roundhouse Millie or Bertie – good reliable runners, can be fitted with a chuffer and probably a whistle, but a bit over the budget! Accucraft Ragleth – excellent slow running, options for R/C, whistle, chuffer, and other possibilities too, but quite large and beyond my budget! And that’s only the easy decision… I’ll still have to choose the colour! I might as well share what I’ve collated about these locos – though I may have made mistakes (and don’t necessarily understand all of it – what is a simulated Stephenson’s link?) Please let me have any corrections! *** I’m not convinced it’s worth fitting chuffers to geared locos, though people have fitted chuffers to both Willi and Vincent, the former being rather conspicuous. Your photo shows a new stretch of track with a viaduct and a covered tunnel, if I’m not mistaken. As for your steam plans/ideas, I trust you’re not asking for an opinion from me! It’s not my photo – I don’t have a steam loco! It is, according to Google, the only Creative Commons licensed picture of any of the locos I’ve discussed – it’s the MSS Saddle Tank (or possibly the original Mamod Saddle Tank, which is very similar). As far as I know, Max is multitrack. So it is! And I guess it must always have been, must have got that wrong back when I wrote this. Fixed now, thanks for the correction. Can I Ask? Where Did You Find a Ralgeth That Costs £660? Your English is fine, you don’t sound rude. In the early autumn of 2015 there were several suppliers offering Ragleth at that price, including Track Shack and Anything Narrow Gauge if memory serves. By Christmas, no Ragleths were available, when the new batch in April came through they were all at £800. I think the prices do fluctuate, but especially with the drop in sterling they cost more now then when I wrote this post.